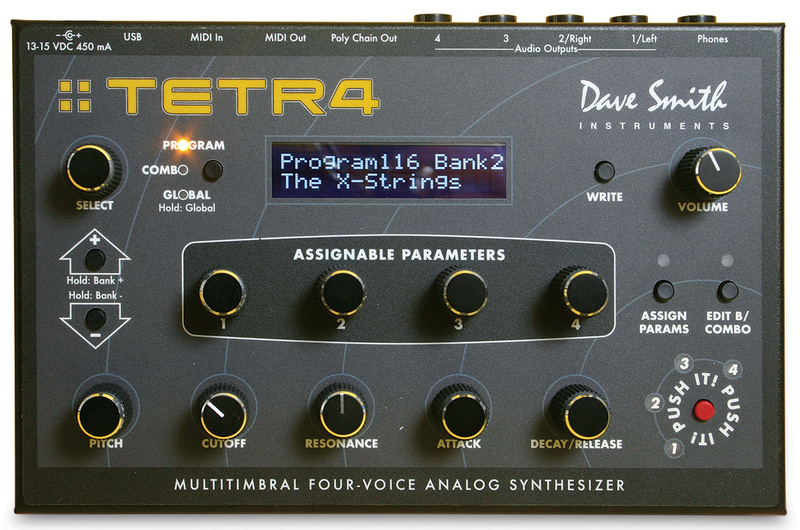 With four voices of genuine analogue polyphony, Dave Smith's Tetra is a big synth in a small box. For players who, up until 1974, had been restricted to monophonic synths (or, at best, a basic form of duophony), the dream of playing multiple, correctly shaped notes simultaneously was synthesizer heaven, and the first instrument to offer this was not Dave Smith's Prophet, the Moog Polymoog, nor even the mighty Yamaha GX1: it was the Oberheim 4‑Voice. Based on four of Tom Oberheim's monophonic SEMs (Synthesizer Expander Modules), this was four separate synthesizers in a single case, but the addition of a voice allocation unit and a voice mixer allowed you to play it polyphonically. There were even a number of bi‑timbral modes that allowed you to play different voices above and below a keyboard split and, later, a programmer made it possible to control and store many of the SEMs' parameter values. The era of the polysynth had arrived but, due to the technology of the era, it was frequently necessary to fine‑tune the SEMs' oscillators and filters if each voice was to respond consistently. With patience, it could be done and, with all four SEMs producing (nearly) the same sound, the results could be magic. And then there was Unison mode, which played all four SEMs simultaneously whenever you pressed a note. With a modified 4‑Voice, you could bypass the internal mixer and pass the audio from each of the SEMs through its own effects and external mixer channel, to create four‑tone monophonic voices that were complex and lush but did not overpower everything else in the track. So why am I telling you all this? It's because, 36 years after the appearance of the 4‑Voice, its monstrous bulk appears to have been reduced to something that you can drop into your coat pocket. 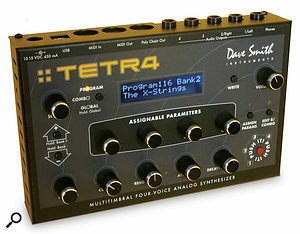 Comprising four separate analogue synthesizers that can be played polyphonically in the normal fashion, split, layered, played in unison to create huge leads and basses, or even programmed individually and played multitimbrally through independent outputs, the little box in question is the Dave Smith Instruments TETR4 (or 'Tetra'). The rear panel accommodates the four audio outputs and a headphone out, MIDI In, Out and Poly Chain Out (for chaining up to four Tetras together), a USB port for connection to your computer, and a socket for the external PSU. I'm not going to describe all the Tetra's architecture here, because I've already done so... it's the same as the voice architecture of the DSI Mopho that I reviewed in the August 2009 SOS, which you can read at /sos/aug09/articles/davesmithmopho.htm. (Or, to put it another way, it's the same as that of the DSI Prophet 08 that I reviewed in February 2008 (/sos/feb08/articles/dsiprophet08.htm), with the addition to each voice of sub‑oscillators and a feedback loop that the manual suggests may add "squirrelly harmonic weirdness”.) Nonetheless, there are some significant differences between the Mopho and the Tetra. The new model is finished in smarter style and looks nicer than its forebear, it's a centimetre wider, there's an extra edit button, and the 'Push It!' knob has four associated LEDs that show which voice(s) is (or are) playing, but that's not what I mean. Most visibly, the Mopho's audio input and its associated input gain knob have been omitted from the Tetra. While a disappointment for sound‑benders who like to turn everything in the world into a filter blip, this makes perfect sense; it would have been troublesome and expensive to add an external input for each voice on the Tetra, and having just one input on a four‑voice synthesizer could have thrown up all sorts of architectural problems. But look at what you gain instead: most notably, two additional outputs and the excellent Poly Chain facility that allows you to chain multiple Tetras into an 8‑, 12‑ or even 16‑voice polysynth. You can also add one or two Tetras to a Prophet 08 (provided that it has one of the more recent OS revisions that support this) to create a 12‑ or 16‑ voice polysynth, albeit with a slightly different specification for voices nine to 16 as for voices one to eight. 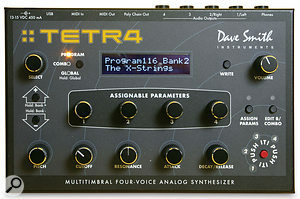 You can even chain a Mopho to a Tetra but, given the lack of Program layers in the Mopho, it may not always be possible to use the combination as a five‑voice polysynth. Ah yes, splits and layers. For obvious reasons, the single‑voice Mopho lacked the split and layer options found on the Prophet 08. Happily, it has been possible to reintroduce these on the Tetra and reinstate a whole family of bi‑timbral Prophet sounds. Indeed, the first two of the Tetra's four sound banks contain the Prophet's factory sounds, which is a nice bonus, although, of course, the maximum polyphony is reduced from eight notes to four. Inevitably, these differences have knock‑on effects within the Tetra's voicing structure. Most noticeably, there are two fewer sources in the Tetra's modulation matrix because it has no envelope follower or external audio peak hold. In contrast, the number of modulation destinations has increased by two, with the addition of feedback volume and gain, plus the addition of output pan as a destination, although these are countered to some extent by the necessary loss of the external audio level in the mixer. Nevertheless, none of these alter the fact that the Tetra is, in many ways, four Mophos in a box or, to look at it from the other direction, half of a Prophet 08 with a number of significant enhancements. The Tetra's front panel measures 207mm by 127mm — just 12mm more than the single-voice Mopho. I spent a lot of time investigating all the permutations of Program mode's splits and layers, the Combo mode, and how Unison affects each. I found a huge number of permutations (well, 14) and, while it would be impractical to explain these in words, I've drawn up a table for that purpose, because neither the manual nor the web site summarises the possibilities like this. There's not space for it here, but subscribers (and eSub subscribers) can find it in the web version of this article at /sos/mar10/articles/dsitetra.htm. While investigating, I discovered an unsung benefit lurking beneath the surface of the Tetra: the 512 Programs within its 128 Combos are not derived from the Programs in its Program mode, they are independent of them, so there are 1024 Programs in total. This has a significant consequence: you can mangle and save the Programs in a Combo to your heart's content, and those held in Program mode are unaffected. DSI should really make a bigger point of this: it's an important improvement when compared with the majority of synths that derive their Multis and Combis from pre‑existing Programs, and on which any change to one always affects the other. In addition to its playing modes, the Tetra also offers a wider range of output modes than you might expect, although, again, how they all work is not always self‑evident. For example, stereo L/R mode is the default, but outputs 3 and 4 are always active and always output the signals generated by voices 3 and 4, even when the Tetra is in its mono or stereo modes. What's more, if you then tap outputs 3 and 4, voices 3 and 4 are not removed from the mono or stereo mix, so they can appear in two or even (if they are not hard‑panned in the L/R mix) three channels each. Confused? Well, I haven't mentioned the two Quad modes yet. Quad LR34 assigns voices 1 and 2 to the 1/L and 2/R outputs, but retains any panning between them, while voices 3 and 4 are routed to outputs 3 and 4. But the mode that appeals most to me is simply called Quad, in which each voice is routed to its own, independent output. Unfortunately, the signals from outputs 3 and 4 are hotter than the same sounds coming from outputs 1/L and 2/R, so you'll have to adjust your mixer to compensate. 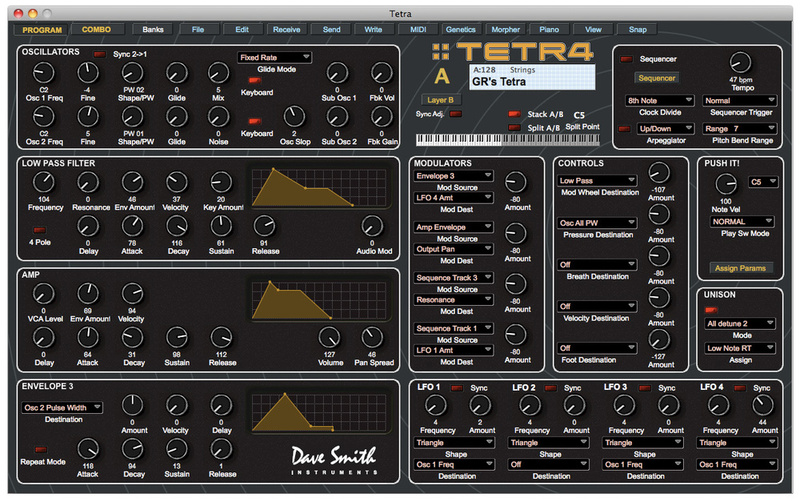 The Tetra Pro editor application. Hooking up the Tetra is a doddle. The universal power supply offers a range of replaceable 'prongs' so that you can use the ones appropriate to the mains supply wherever you are in the world, so I replaced the US connectors with the British ones (which took all of 10 seconds), plugged in the power, and then plugged four audio cables into the four outputs. Having done this, I hooked the Tetra up to my MacBook Pro via USB, connected a Korg MS20iC USB controller keyboard, routed the MIDI using Plogue Bidule, and started to play. Although PC users will have to fiddle around with device drivers and properties, the Tetra had taken me about a minute to hook up, and everything worked immediately. When I first received the Tetra, I noticed that the filter calibration of the four voices was not consistent from one to the next. Happily, the Tetra offers a routine that takes care of all the oscillator and filter calibrations. It takes no more than a couple of minutes to do its stuff, after which the only significant differences between the voices are the ones that you program yourself, not the vagaries of analogue electronics. I tend to use synthesizers' voicing controls as they were originally intended — to program sounds, not as performance controls. But if you are a committed knob twiddler, you'll find that, once you have programmed the Tetra's four assignable knobs, its full complement of eight performance knobs (the assignable ones plus dedicated controls for the filters' cutoff frequencies and resonances, and for the VCAs' Attacks and Decays/Releases) should suffice for all but the most extreme needs. Now, what of the sound? To be honest, there's not much that I can add to the conclusions I reached when reviewing the Prophet 08 and the Mopho. I have played the odd analogue synth or two over the years and, even though your eyes tell you that the Tetra looks like a little digital box with a bunch of DSPs inside, it sounds like a big analogue synth (which, of course, is what it is, except for big). This is particularly true if you take the time to investigate Combo/Quad mode, treating, panning and EQ'ing each voice separately with external effects and a mixer. Discover how polyphonic synths sounded in an era when each note in a chord was generated by a separate synthesizer, subject to its own drifts and other vagaries! So does this leave any room for criticism, deficiencies or a wish‑list? Of course it does, but not much. I found just one bug. When you scroll through a Bank, some of the Programs (for example, Bank 1/55 'Spit 'n Spank' and Bank 2/86 'Gemini Lead') generate a pop or splat. As for deficiencies, when reviewing the Mopho I commented that its arpeggiator and sequencer were both gated, meaning that you have to hold down a note using MIDI or the Push It! button for them to run. I also complained that the arpeggiator had no random mode or multiple octaves. Unfortunately, none of these issues have been re‑addressed, so these are areas in which the Tetra's close relationship with the Mopho is not to its benefit. While I'm moaning, I'll also mention the Tetra's unusual 13V AC/DC power adaptor. Given that DSI have kept both the size of the Tetra and its cost down, the use of a wall‑wart is acceptable but, as with the Mopho, there's no on/off switch on the synth itself, and inserting or pulling out the power connector (or switching on and off at the wall) creates a mild thunk. For the cost of a low‑voltage switch, I think that DSI might have addressed this when adding the extra half inch to the Tetra's chassis. As for a wish list, I couldn't help wondering whether DSI were thinking about adding more filter modes to the Tetra. After all, part of the 4‑Voice's charm was the SEM's state‑variable filter, which offered low‑pass, band‑pass and high‑pass modes. I asked DSI about this, but they told me that it would require hardware changes, including off‑chip circuitry, that would add considerably to the cost of the Tetra. It's a shame, but a reasonable answer. As you would expect from its background, the Tetra is a super little synthesizer, and it offers far more than its diminutive size would suggest. Whether used as a four‑voice polysynth, a set of four, independent (almost) fully‑featured Mopho monosynths, or as a single, massive multi‑tonal monosynth, it impressed me. And, although I had no opportunity to test this, I am confident that one or more units would perform admirably as expanders for Prophet 08s, or even as 8‑, 12‑ or even 16‑voice polysynths in their own right. Half a Prophet for £560$799? Something akin to a modern‑day 4‑Voice? Or four updated Pro Ones for around £140$200 each? Either way, I think that it's fab value. Well done to Dave Smith and his crew. Given the independent outputs for each voice, I suspect there's nothing that competes directly with the Tetra. The only module I can think of that's still in production and offers similar specification is the Studio Electronics Omega 4 but, at around four times the price and many more times the size and weight, this is not really a competitor. If you want to look at alternatives rather than direct competition, I would recommend DSI's own Evolver, which sacrifices the Tetra's all‑analogue signal path, multiple outputs and a few other tricks, but offers additional oscillator types, a high‑pass filter and on‑board effects. Architecture: hybrid analogue/digital synthesizer with analogue signal path. Number of voices: four, each with a four‑row, 16‑step sequencer. Oscillators: two per voice, with hard sync, plus noise. Sub‑oscillators: two per voice: minus one octave and minus two octaves. Filter: one LPF per voice, user‑selectable 12dB/octave or 24dB/octave (self‑oscillating) plus feedback. Contour generators: three HADSR envelopes per voice. LFOs: four per voice with MIDI sync. Arpeggiator: up, down, up/down, with MIDI clock sync. Memories: 512 Programs and 128 Combos that include a further 512 Programs. MIDI: In/Out via USB2 and In/Out/Thru via five‑pin DIN. Polychain: up to four units. Audio: four quarter‑inch mono outputs, plus stereo headphone output. Physical: 207 x 127 x 70mm (approx). In common with all synth modules of this format, the Tetra sacrifices rapid programmability for size, convenience and, of course, low cost, so I found myself wishing I had a Prophet 08 to hand. This is because the Tetra's voice parameters (with, of course, the exception of the sub‑oscillators and feedback) map directly to the 08's control surface. Unfortunately, I gave the review unit back two years ago, so I turned to the Prophet 08 and Mopho editors still on my Mac to see whether these would program the Tetra. Both worked perfectly, notwithstanding that some of the Tetra's voicing parameters are not represented on the Prophet's editor, and Combo mode is missing from both. In retrospect, I'm not surprised... If the Prophet 08 itself can edit the Tetra and the Mopho, it's logical that their editors should be cross‑compatible within the limits of each synth's architecture. Having established this, I decided to do the job properly. 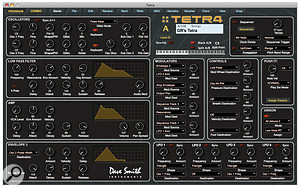 I downloaded Tetra Pro from www.soundtower.com for $39.99, authorised it, and had it up and running within seconds. Everything now fell easily to hand, and the Tetra became much more intuitive and usable. TetraPRO also incorporates the Snapshots, Genetics (creating new patches from a Mommy and Daddy) and Morpher facilities (which allow you to morph from one Program to another) that I described in my review of the Mopho and, as evidenced by its 60‑page manual, it's far from a trivial piece of software. Despite one bug on my system (attempting to close the Genetics window using Cmd‑W quits the whole editor) I recommend that all Tetra owners purchase the full version rather than the more limited, free of charge 'LE' version because I think that it will be money well spent. The day before I submitted this review, Dave Smith Instruments announced the Mopho keyboard, a knobby version of the monosynth with a whole load more knobs and a diminutive (but full-sized) 2.5-octave keyboard. The Pro One is indeed reborn! Some will take this to imply that there might be a keyboard version of the Tetra at some point in the future. If so, join the queue, but don't hold your breath... having discussed it with Dave Smith, I understand that there are currently no plans for a Tetra keyboard. Program Off 4 Monotimbral four‑voice polysynth. Program On (A) 1 Monotimbral monosynth, with all four voices layered. Program On (B) 4 Monotimbral four‑voice polysynth (layer B is unused). Program On (A&B) 4 Monotimbral four‑voice polysynth (layer B is unused). Program Stack A/B Off 2 Two sounds layered across the whole keyboard. Program Stack A/B On (A) 2 Two sounds (voices 1&2 in unison, and voices 3&4). First note plays voices 1, 2 & 3. If sustained, second note plays voice 4 only. Program Stack A/B On (B) 2 Two sounds (voices 3&4 in unison, and voices 1&2). First note plays voices 1, 3 & 4. If sustained, second note plays voice 2 only. Program Stack A/B On (A) On (B) 2 Monotimbral two‑voice synth (voices 1&2 in unison, and voices 3&4 in unison). Program Split A/B Off 4 Bi‑timbral, two voices either side of a split point. Program Split A/B On (A) 3 Bi‑timbral, two voices either side of a split point. Layer A (lower) is monophonic (layered). Program Split A/B On (B) 3 Bi‑timbral, two voices either side of a split point. Layer B (upper) is monophonic (layered). Program Split A/B On (A) On (B) 2 Bi‑timbral, two voices either side of a split point. Both sides of the split are monophonic (layered). Combo On 1 Four independent sounds (if desired) stacked as a single quad‑timbral monosynth. It's small and neat, but can be edited fully (if slowly) from its own panel. You can cascade multiple units to create up to 16‑voice polysynths. It's truly multitimbral, with independent outputs for each voice. You need a Prophet 08 or software editor to program it quickly and intuitively. For some people, there is no substitute for a pure analogue signal path, no matter how many extra sounds and facilities can be made available more cheaply using DSPs. For them, the Tetra is an excellent option; small, neat, flexible, great sounding, and very cost‑effective. MacBook Pro, 2.6GHz Intel Core 2 Duo, Mac OS 10.6.2.